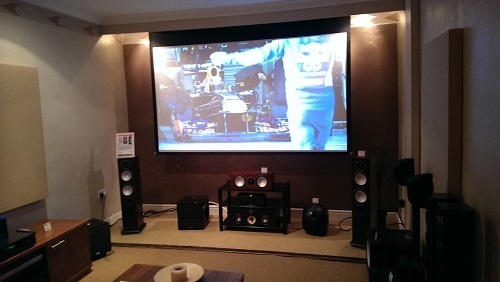 Dolby Atmos has arrived in Cardiff Audio T just in time to take shelter from the pelting rain. Up and running in our home cinema demonstration room we have the award winning Pioneer SC-LX58 with Dolby Atmos update. The LX-58 receiver is fed by the new Arcam FMJ UDP411 universal disc player. This fantastic combination of electronics is teamed with Monitor Audio Silver 6 front left and right, centre and Monitor Audio Radius speakers as back surround channels. Overhead is where the magic really happens, with Dolby entering the next level of cinema experience with the addition of four in-ceiling speakers - two front high and two back high. These are highlighted in the picture below. All these speakers have then been underpinned by two REL subwoofers, the REL T7 and REL Habitat. This configuration is pumping out 5.2.4. So that’s five surround speakers as in a normal 5.1 setup with the extra sub woofer and four ceiling speakers. Dolby Atmos is capable of 7.2.4 configuration as well. Sound comes from all directions including overhead. Specific sounds move around you in multidimensional space, so you feel you are right at the heart of the action. This is something that has never been heard before in such detail and depth. Dolby Atmos is based on audio objects rather than channels. This allows the creators of the content to tell the story more accurately so you can experience the film or music as the artist intended. This is achieved by being able to place sound above as well as across the channels making action in the scene realistic and precise. Any sound can now exist as an independent audio object, free from channel restrictions. It can be placed or moved anywhere, including overhead. We believe that sound plays such a huge part in the cinema experience and Dolby Atmos is the closest to the real deal. This is a game changer so call today to book a demonstration. Audiolab & Monitor Audio Day!